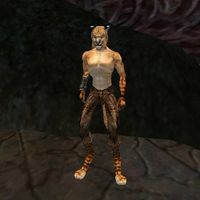 J'Saddha is a Khajiit slave who has escaped from Ald Velothi. He is being sought by three slave-hunters, Anes Hlaren, Garyn Girith and Sadal Doren. You will be asked to throw them off his trail in a Twin Lamps quest. Due to a minor glitch in the dialogue, J'Saddha's name will appear as a topic with pretty much everybody in the world after you first hear about him. Unfortunately, there is nothing you can do about this, though there are some 3rd-party mods which correct the error. This page was last modified on 23 February 2019, at 21:02.